Големина на овој PNG-преглед на оваа SVG-податотека: 512 × 587 пиксели. Други разделности: 209 × 240 пиксели | 419 × 480 пиксели | 523 × 600 пиксели | 670 × 768 пиксели | 893 × 1.024 пиксели. 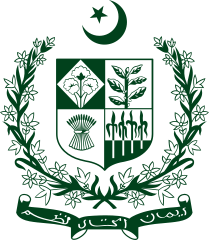 English: State emblem of Pakistan. тековна 16:36, 22 јуни 2016 512 × 587 (112 КБ) Schajee This is a simpler, smaller version with no white areas. This emblem is purely green, and is probably a better option for use on non-white backgrounds. There are no other visual changes, paths inside the file have been named, and groups have been removed. 05:40, 30 јануари 2014 624 × 716 (278 КБ) Fry1989 That's perfect! Forgive me but just returning the previous shade of green. 05:18, 30 јануари 2014 623 × 715 (277 КБ) Prez001 Clear and more defined elements.